The much anticipated debut album fuses the sounds of Merle Haggard, Hank Sr, and Waylon Jennings with Social Distortion, ZZ Top, and Bad Religion by combining bold lyrics with country & western melodies and brash punk beats. Bevill began writing songs back in 2008 about death, revenge, debauchery, Texas, and an attempt at forgiveness over many bottles of Lone Star beer and “Old No. 7”. 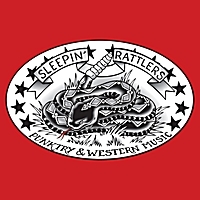 After sitting on those songs for three years, Bevill united with lead guitarist Kane “the Killer” Kelly, and with a common motivation to unleash an outlaw country sound, the Sleepin' Rattlers were born in August of 2011. Combining bold lyrics with brash punk beats and country & western melodies, Brad soon saw the need to enlist the aid of legendary, Nordic, honky-tonk, bass behemoth Kevin “Viking” Poe and Berklee banger Brandon "Spud" Rice on drums. With the band line-up solid and songs written, Bevill then called on country-punk veteran and good friend, Robert Jason Vandygriff, of the Von Ehrics to produce the debut record. “I can’t give Vandygriff enough credit for what he’s done. He has been a part of the entire process – from demoing the songs to producing every track we put down in the studio to supporting our live show. We couldn’t be happier,” said Bevill. But the Sleepin’ Rattlers wanted even more. As important as it was to make a good record, it was just as important to make that record with friends. “I just wanted to do this with our buddies and I wanted it to be more dynamic than is possible with four musicians,” said Bevill. So the Sleepin’ Rattlers added guest vocals from Oliver Peck (Elm St Tattoo, Ramonahs), Mo Robson (Mo Robson Band), Jason Vandygriff (Von Ehrics), and Cxs Smyers (Greyskull, Ramonahs). They also added Aaron Wynne (Eleven Hundred Springs, Mo Robson Band) on steel guitar and Hallie Yarbrough (2008 Louisiana State Fiddle Champion, Charlie Daniels Band) on fiddle.